Buenos Aires is a stunning city, rich in colonial and political history, chock-full of trendy art and fashion and baked empanadas. Its cheap wine and funky atmosphere are two of many reasons why its one of the most relaxed and hip metropolitan areas in the world. I was fortunate enough to spend my time romping around the city with a handful of friends. Some were from home and traveling along. Some were living temporarily as expatriates. Some were new friends, ones I met along the way. Below are a few images from my trip. In the Retiro district, the British Clock Tower stands tall. Retiro is known for its high-end residences, transportation terminals and five-star hotels. This tower was a gift from the local British community and was inaugurated in 1916. One morning, I had a meeting in Recoleta. With a healthy dose of green space, stylish statues and plazas and luxurious apartments, Recoleta is another popular district for the affluent. It’s famous for its cemetery, which caught the corner of my eye during the meeting. Before I headed back to the hotel to write up my report, I walked over to explore. 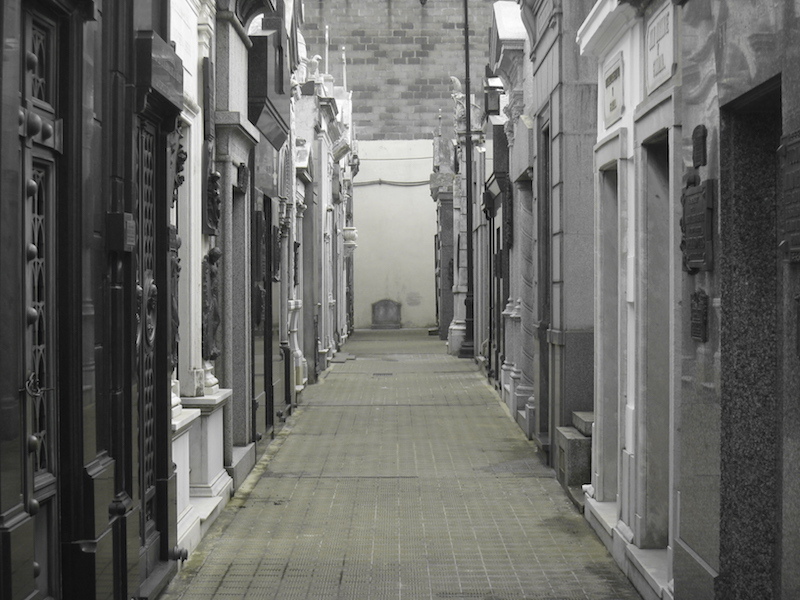 The Recoleta Cemetery houses some of Argentina’s most iconic figures—Eva Perón, Raúl Alfonsín, and several former presidents. I really enjoyed the layout. It was eerie and symmetrical and architecturally stunning. I wasn’t looking for anything specific. Caffeine was seeping through my veins, and I needed to let the mind wander. I walked around a lot. I took pictures and turned corners. I found a textual summary of the cemetery’s history and read about neo-classical gates, the monks of the Order of the Recoletos and a nineteenth-century yellow fever epidemic. The cemetery contains space for 4800 ground-level vaults. The Facultad de Derecho, or School of Law, at the University of Buenos Aires. It was under construction, but that didn’t stop some friends from sprinting up its steps. The University of Buenos Aires is Argentina’s largest educational institution, and one of Latin America’s most prestigious. In La Boca district, the Boca Juniors are one of the Argentina’s most successful sports clubs. The day before I left for Uruguay, I was fortunate enough to catch a soccer game. At the end of the game, stadium officials (and local police) facilitated traffic by staggering our exits. Across the stadium are a compact section of Boca Juniors fans, disparaged from the 4-1 loss. The rest of the stadium is empty, but the Boca Juniors fans have not yet been authorized to leave. At Cabañas en las islas, I indulged in the most toothsome rib-eye of my life. It literally, I mean literally, fell apart in my mouth. Argentina, where steaks are an art form, has the highest per capita meat consumption in the world. With its fertile grasses and ideal climate, no hormone shots or special feeds are necessary. The meat is naturally divine. 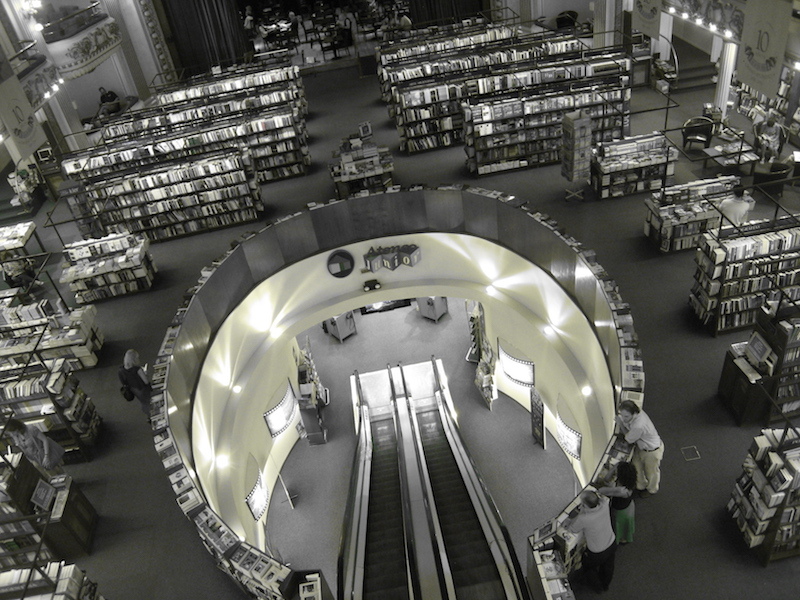 El Ataneo Grand Splendid is one of the most well-known bookstores in Buenos Aires. As you might be able to tell from the photograph, it originally opened as a theater in 1919. Eventually, the seating capacity of 1,050 gave way to bookshelves. Where the stage once was, an elegant café serves up gourmet coffee and pastries. While I only had a few days in Buenos Aires, I enjoyed my initial impressions, enough to warrant future trips. Anyone care to join me? On Friday, stay tuned for an update from Uruguay. Hope you enjoyed! Awesome photos! BA is pretty much the best place in the world as far as I’m concerned. On your next trip you need to get to Mendoza for some awesome wine & biking! I’m sure you would LOVE Patagonia as well. I want to go back now haha. I remember spending hours in that cemetery and eerie is the perfect way to describe it, especially just before sunset. And while I didn’t eat any steaks (not really a meat eater), I did eat my fair share of empanadas. I’ve never eaten an empanada anywhere that comes even close to the perfection of those sold by one man I found in La Boca who carried around a huge basket full of them. Nice pics Alan! My friends just got back from Buenos Aires a week before you were there I believe, and only had good things to say about it. It’s quite the immense metropolis, and always blows my mind how far south it is when looking at it on a map. Did you make it to the Casa Rosada at all-residence of arguably the best-looking head of government in the world? Alan, I’m here in BsAs now. Halfway through a 6 week stay I absolutely love it. The steaks, empanadas, and wine really do satisfy. I haven’t made it to a Boca Juniors match yet but certainly intend to. Very cool shot of the staggered exit strategy. Any particular words of advice after attending a match yourself? Thanks! 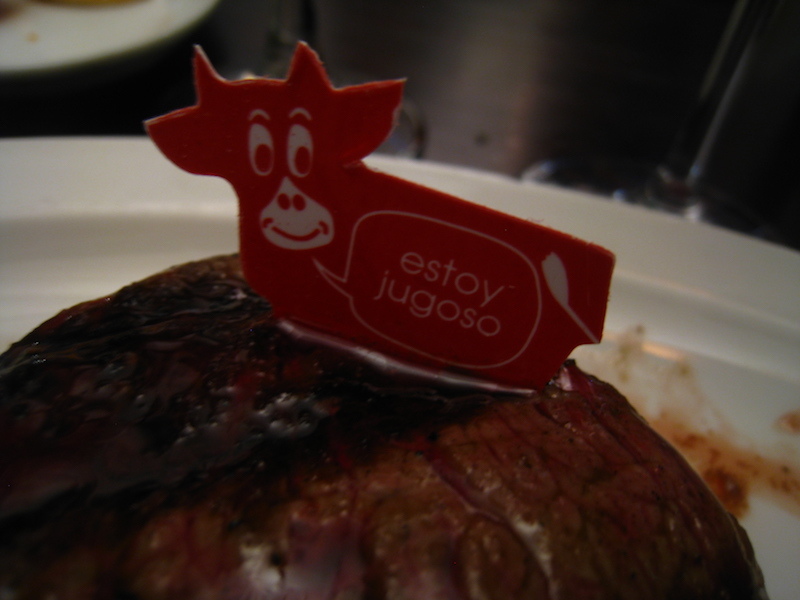 I cant wait to visit Argentina and man that steak looks awesome! To read that is fell apart in your mouth only makes me want a taste even more. Love the photos but heed this warning which contradicts the info about the steak. Most of Argentina has never seen green grass and while the lack of special feed and hormone shots were once the rule, it is now somewhat of an exception. Having said that, I still agree that steak is an art in Argentina and few, if any, places can do it better. City looks amazing. Never been to S-America. Have to add it to my (ever growing) list.